It looks just like your classic bruschetta, but ours, made with red peppers and feta, has a bit more bite. Mix peppers, cheese, onions, 1 Tbsp. of the oil, the garlic and lemon juice; set aside. Brush bread slices lightly with remaining 3 Tbsp. oil; place on baking sheet. Broil 2 to 3 min. on each side or until lightly toasted on both sides. Top each toast slice with about 1 Tbsp. of the pepper mixture. Using flat edge of chef's knife, smash down on garlic clove to loosen skin. Remove skin. Cut the peeled garlic clove into thin slices. Then, using chef's knife and holding down tip end, cut back and forth across the garlic until finely minced. 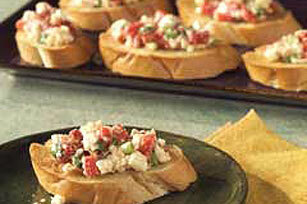 Prepare as directed, using ATHENOS Feta Cheese with Peppercorn. To toast bread slices on the grill, brush bread slices with oil as directed, then place on a cooler portion of the grill grate. Grill until lightly toasted on both sides, turning frequently.